Archivists use a number of tools to handle and care for fragile documents. Cotton gloves help prevent the transfer of damaging oils from our hands onto photographs, while the microspatula allows the safe removal of staples and other potentially damaging fasteners. In addition to controls on temperature and humidity, specially manufactured folders, boxes, and paper help to protect documents. These storage items contain the proper pH, are free of acid, and have low levels of lignin to prevent staining, fading and degradation. While seemingly outdated, microfilm is still considered one of the best preservation methods for archival materials due to its durability and longevity. 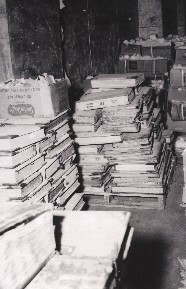 Buchanan County deed books in storage freezer following 1977 flood. Following consultation with records professionals, local officials freeze-dried the damaged items then sent them to Library of Virginia for further treatment.